You are in for such a treat today! 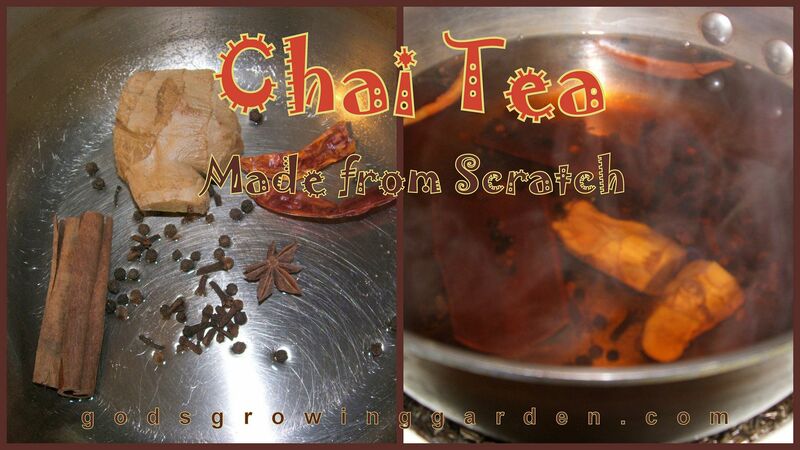 Angie of Gods' Growing Garden brings us a wonderful chai recipe just in time for Fall's cooler temps! I am thrilled to be "guest posting" for my friend Marci! "Stone Cottage Adventures" has been one of my favorite blogs for many years. Today I am going to share with you my version of Chai Tea - no caffeine! This is an herbal version of the traditional Chai Tea that you might buy in a tea shop - this is naturally caffeine free. I drink this every night before I go to sleep and it is so soothing and relaxing. I have a pot (or pan) of this Chai Tea at the back of my stove at all times - it stores well at room temperature for up to 2 weeks. I add a little water every night and warm it up when I want to have some - so simple, affordable, healthy and long lasting. Ginger Root - is relaxing, aids in digestion, it is good for your equilibrium and for inner ear issues..... and much more. Cinnamon - is good for your blood sugar, aids in lowering cholesterol, helps relieve indigestion and colds. Peppercorns - increases stomach activity and digestion, it has antioxidant and anti-bacterial effects. Chile Peppers or Cayenne Pepper - increases circulation and heart health, cancer preventative, aids in weight loss and is great for the intestinal tract. Star Anise - this is actually the spice that they extract "Shikimic Acid" from - which is used to make the antiviral drug "Tamiflu" (which has been used to treat the Swine Flu). It also decreases abdominal cramps and expells mucus. Place all of these ingredients in a stainless steel pot and cover with 5 to 6 cups of filtered water. Boil for about 10 minutes and then turn off the burner. Allow this tea to steep overnight on the back of the stove (Make sure that your burner is turned OFF!). Then the next day your tea is ready for drinking - simply warm it up when you desire. Add a little more water whenever you take some tea out and keep it topped off and ready for the next time you want some Chai Tea. After 2 weeks you will need to start from scratch again with new and fresh ingredients - and the initial steeping overnight is only done that first time - at the beginning of a new batch (once every 2 weeks). NOTE: When the tea has boiled and you are ready to drink - just remember to strain out the spices before drinking - and then return any peppercorn or clove back into the pot for the next time that you want to have this tea. This tea is great plain or with some half & half cream and/or some honey added! Thank you again for allowing me to guest post on your wonderful blog! Well how perfect with cooler weather coming on here! I love chai and can't wait to give this a try! Thanks for sharing it Angie!